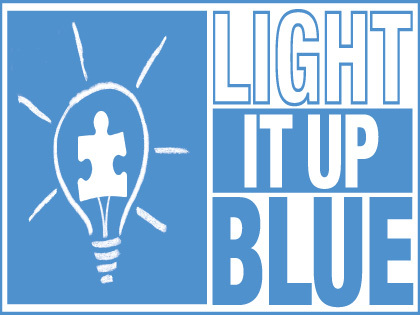 April 2nd is now recognized as WORLD AUTISM AWARENESS DAY. Last week statistics hit the news that cited that one of every 88 children born in the United States will be diagnosed with Autism prior to their eighth birthday. Seriously, this fact took my breath away. I clearly recall the first time I ever heard the word, AUTISM. It was back in the 1970’s and not many people knew what it meant. Fewer had ever seen or worked with a child with Autism. Talking with phrases “On the Spectrum” or “Having mild autism- Asperger’s- was never heard. Years later I now not only understand what Autism means but have worked in the trenches with children with Autism for over two decades. Many of them have secondary disorders, such as Deaf AND Autistic. I also have acquired a very deep and heartfelt respect for the parents who give to their children unconditionally and would sell their souls to find ways to make their child’s lives easier. In addition, I cannot give enough Kudos to the educators, therapists and other professionals who work tirelessly to help children “on the spectrum”. Since my work is “all about education”, I am listing some of my most favorite resources. Not all are dedicated solely to Autism, but if you click on them perhaps you will find information, assistance or some value to the company or organization listed. My apologies in advance for forgetting to mention sites that may have slipped my mind. I will be sure to add to the list as the days go on. AND.. PLEASE feel free to add to the list in the comments section below of your favorite Autism related materials/ websites/ resources, too. AUTISM SPEAKS- This is what many consider as the “FACE” of Autism organizations. Their website is full of great information. Although for some it may be very overhwhelming. EDUCATION.com – This website is packed full of information about Autism and much, much more. From A-Z you can receive information and assistance. I am proud to be a member of Education.com as one of their JustAsk contributors! THE COFFEE KLATCH – I first followed this group on TWITTER (#TCK) and now am a huge fan of all their work, including the TCK website and radio programs. THE AUTISM NEWS / ZAC BROWSER and more – this is a set of websites constructed by a dad and his teen son with Autism. Filled with no nonsenese information, as well as games that are helpful for kids on the spectrum. KABONGO – Interactive methods to teach reading skills. Great for kids who relate virtually. I love this site and you will, too! KIBOOMU and LISTEN TO ME PLEASE – Music can be a great force to help children learn who have language and social-emotional challenges. These websites are great! Kiboomu offers apps as well. Listen to me Please has corresponding reading materials, such as their award winning books. Both sites are exceptional and worth more than a glance. AMAILIA STARR , author of RAISING BRANDON. So much is written about children who have Autism. However, not much is scribed about adults with Autism. Here is a book that will tug at your heart strings and give you hope at the same time. I know Amalia personally and am proud to list her here! NATIONAL ASSOCIATION FOR SCHOOL PSYCHOLOGISTS and WRIGHTS LAW – These two websites are premiere for understanding the IEP process and the laws regarding Special Education. I could be here for hours more typing more resources for you. Instead, I will let you comment below with YOUR favorites.